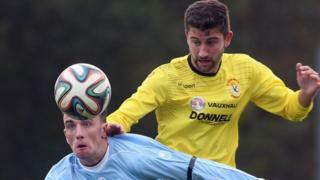 Dungannon Swifts remain with only one win in this season's Premiership after Institute fought back to earn a point in Saturday's game at Drumahoe. Ryan Harpur headed the Swifts into a 15th-minute lead as he connected with a cross from the lively Matt Hazley. Institute improved in the second half and Dermot McCaffrey blocked a Graham Crown effort before Swifts keeper Alvin Rouse saved a Mark Scoltock shot. The equaliser did come on 72 as Stephen O'Flynn fired gloriously past Rouse.